Now You Can See All of Your Town on a Quart of Gas! From Los Angeles to San Diego, We have been building gas bikes for happy riders for the last four years! Our motorized bikes provide our riders a fun and an unbelievably cheap way of getting around! If you are a student, retiree, or anyone who wants to save a ton of money on gas, we have a motorized bike for you! Our bikes are quicker than cars on short distances, can take on hills and can be parked just about anywhere! Below are just some of our newest videos of riders who finally decided to try out our motorized bikes. These bikes have saved our riders on gas and time on short commutes and some of our riders have even given up on their cars altogether! Sergio's beautiful Navy Blue beach cruiser was definitely worth waiting for! We didn't know it was his birthday when his wife surprised him with it! Have fun with it Sergio and Happy Birthday! Cris' eye catching chromed out beach cruiser was totally one of a kind! It came with old school rocket front lights as well as a springer fork! As you can see, it is a totally one of a kind headturning cruiser for sure! Chris could not wait to get his hands on this one of a kind "ghost" motorized Electra Cruiser! As you can see, we can't blame him waiting two weeks for his order to get completed, but the waiting was all worth it! 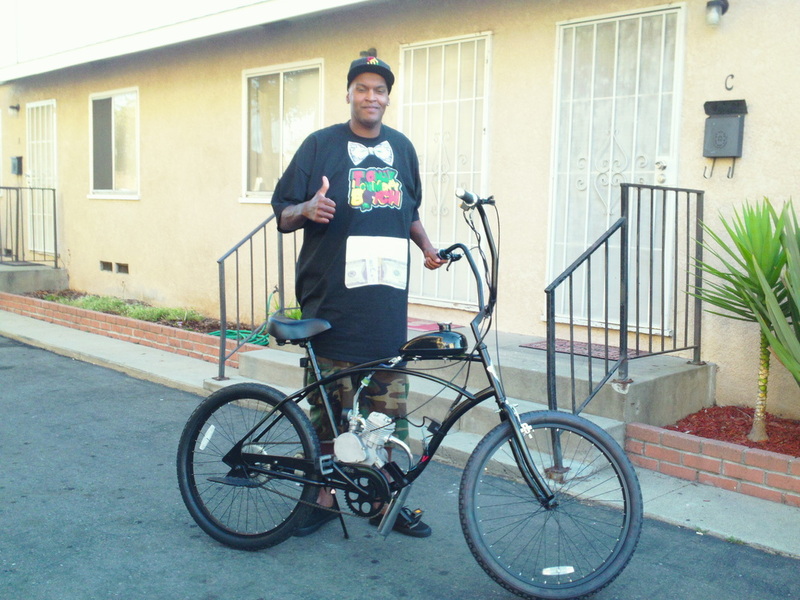 Ron waited two weeks for his sleek looking motorized Electra Beach cruiser! His cruiser came in Midnight Black with green pin stripe, we custom welded a front engine pedestal mount and finished off with ape hanger handle bars! We also lengthened the front throttle and clutch cable to reach the engine without them being pinched when turning the handle bars. The bike totally turned heads on our break in ride at the local Walmart parking lot with the local customers! Here is more of Ron's Custom motorized Electra Beach Cruiser in action! And just think what you'll do with all of the money you are going to save on gas! With the cost of gas still at an all time high, we have happy riders who have substituted their cars for their commuting needs! Our bikes get between an unbelievable 100 to 150 miles per gallon at 40 miles per hour! There has never been a better time to get a motorized bike! From mountain bikes to beach cruisers, we have built them all! Or, you might own a bike that you can bring to us and save by having us put a motor on it. Our prices start at only $399! But the good news is that your investment will pay for itself in gas alone in just a few weeks!